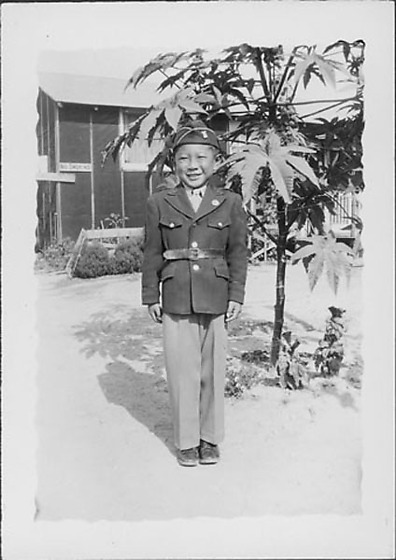 Smiling boy dressed in a United States Army dress uniform stands with arms at his sides near a tree with large leaves at Rohwer concentration camp, Rohwer, Arkansas, August 6, 1944. The uniform includes light-colored slacks, belted jacket with circular pin on lapel over light-colored shirt and necktie, and a dark overseas cap with a pin on proper L. Barracks with "No Smoking" sign on L corner in background. Image has irregular scalloped border. Same boy in 97.292.11E.